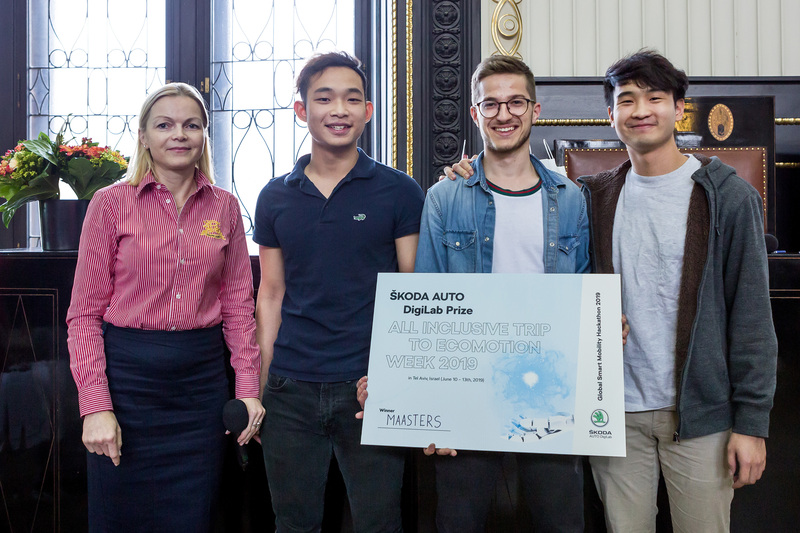 Mladá Boleslav / Prague, 15 April 2019 – As the host and an official partner of the event for the third time, ŠKODA AUTO DigiLab invited talented programmers to the Smart Mobility Hackathon in Prague. More than 60 creative minds developed innovative concepts in relation to smart cities, green mobility and connectivity over the course of the 48-hour programmer competition, which ran from 12-14 April. In addition to the organiser’s grand prize of 5,000 euros, ŠKODA AUTO DigiLab also awarded team MAASTERS the prize of taking part in the internationally renowned mobility conference EcoMotion Week 2019 in Tel Aviv for developing a special algorithm to predict the price of used cars. What does the mobility of the future look like? What part do electric vehicles play? What do intelligent traffic concepts such as car sharing contribute? And what might the infotainment system of a ŠKODA KODIAQ look like in 2029? Participants addressed these questions and more at the Smart Mobility Hackathon Prague 2019. 22 teams from 13 countries addressed the challenges of clever mobility concepts at the international programmer competition, which ran from 12-14 April in Prague. At the 48-hour hackathon, participants competed against one another in teams of three and devised innovative projects across eleven different categories such as e-mobility, clever parking, in-car delivery, multimodal transport, urban traffic or efficient delivery services. Several mentors, including experts from ŠKODA AUTO DigiLab as well as from the Development, Production and IT departments at ŠKODA AUTO, supported the aspiring talent. In the end, team Herfat Father were victorious with their project Gulliver – a route planning app that is based on emotions, thus securing the grand prize of 5,000 euros from the event’s organiser CEEHACKS. As a partner and the host of the event, ŠKODA AUTO DigiLab brought together creative minds from across the globe at the third edition of the hackathon. In addition to the winning team from the Clever Mobility Hackathon in Beijing organised by ŠKODA AUTO China, the Israeli start-up AiGENT-TECH also took part on the recommendation of ŠKODA AUTO DigiLab Israel in Tel Aviv. Both teams impressed with clever ideas and were among the favourites for the overall win. The Israeli team received an award from one of the partners of the event for their multimodal transport project. Team MAASTERS ended up in third place overall. This team included programmers who won the Clever Mobility Hackathon in Beijing. In Prague it has been awarded an additional partner prize by ŠKODA AUTO DigiLab Prague for developing a special algorithm to predict the price of used cars. Their prize is the opportunity to take part in EcoMotion Week 2019 in Tel Aviv. This prestigious mobility conference will take place from 10-13 June in the Israeli IT metropolis and is globally considered a platform for innovations relating to smart mobility. In Israel, the team will be also be supported by the local team of ŠKODA AUTO DigiLab Israel. ŠKODA AUTO DigiLab is considered a centre for the development of ideas and solutions for pioneering mobility services. By being involved in the Smart Mobility Hackathon, ŠKODA AUTO DigiLab is encouraging innovative and creative talent to showcase their abilities to an audience of experts. The best projects have the chance to be developed further together with ŠKODA AUTO DigiLab. 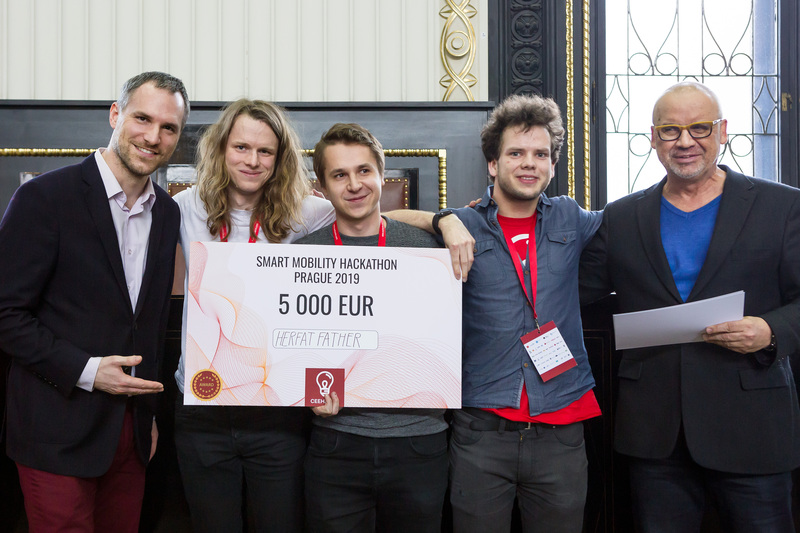 For example, Russian start-up ToporAuto – winner of the Prague Hackathon 2018 – is currently developing a service that monitors and analyses the condition of road surfaces using accelerometers and GPS data in passenger cars. By taking part in the Volkswagen start-up programme at the Future Mobility Incubator in Dresden’s ‘Gläserne Manufaktur’, ToporAuto had the opportunity to spend six months working on its own ideas and is continuing to benefit from the programme’s support.